In the very first sentence: “The girl made him uneasy…” Malla Duncan sets the scene for the whole of her novel, ‘Deep as Bone’. Who exactly is this girl? We spend the rest of the book discovering the answer to this conundrum. The book is a cleverly crafted and beautifully written jigsaw puzzle of clues that eventually fit together in the way that most gratifies a reader – it is so satisfying to feel you have solved the riddle single-handedly without any unduly obvious interference from the writer! Time is a significant factor in the book – throughout it we are taken back into teasing glimpses of Ilse’s enigmatic past, which strangely mirror events that transpire in the present. We are given hints about a tragedy – a back story that unfolds in parallel with a more recent secret history within the family in which Ilse has become so intimately involved. Ilse is a complex, intriguing character, and we see everything through her eyes – but can we entirely trust her take on things? I found myself at times suspicious of each of the major characters – all of whom are skilfully drawn. There is death at the dark heart of the story – as we continue to read we realise increasingly that the 5 year old child, Amy is haunted and disturbed with good reason. She has been the unwilling witness to something traumatic that happened before she had the language to describe it, and its horror wakes her every time her missing aunt Clare is mentioned. Ilse, who has arrived to take on the job as Amy’s governess, seems to be the only adult who really understands her and relates to her – seeing reflected in this troubled child her own distressing, lonely childhood. We feel sympathy for them both as Ilse sets out to find the cause for Amy’s nightmares. What is it she has seen? What does she know? 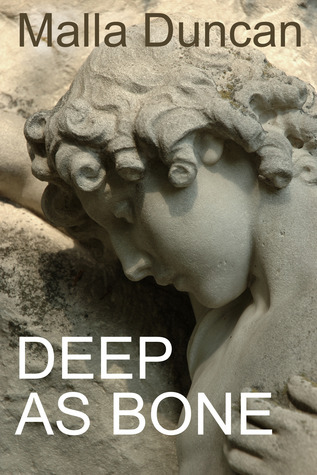 Like me, you will read on with increasing fascination as the story takes you on a journey into Ilse’s mind as well as following her quest to dig deep enough to find the truth. To the very end, you will remain uncertain as to how things will turn out. And the revelatory denouement will finally make sense of the chilling beginning as the last few pieces fall into place. When I began reading ‘Deep as Bone’ I recognised elements of Gothic fiction, and was reminded of Jane Eyre – the dark mansion, the house of secrets, the handsome husband who has lost one wife and is in thrall to her successor, the coldly resentful Melissa. But as I continued reading I found that this was not fiction that belonged to any particular genre, nor does it need to. It is literary psychological fiction at its best, worth every one of the 5 stars I have given it. 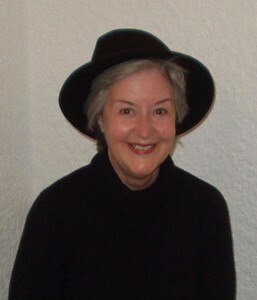 I will be reading more of Malla Duncan’s novels, all of which can be found on kindle at Amazon. Malla was born and still lives in Cape Town, although she usually sets her novels in England. She writes mainly women’s psychological murder mystery suspense thrillers, about real women characters who find themselves in tricky situations, often with their lives at stake. If you like pace, non-formulaic writing, and some quite chilling stuff, her books are for you. Alice was a lonely child. You’d think living in a busy flat, people packed in on every floor, she would have plenty of friends but Alice had none. She had a mum and dad who loved her but they were always just a little too busy to play the way Alice wanted to play. Alice craved companionship. She’d had a friend once, a long time ago but Alice couldn’t remember why they left or where they went. The memory eluded her yet sometimes when she would draw chalk rainbows on the flags in the little backyard outside the flat, a hazy tingle of a distant memory would almost surface; a fraction of a name or a swirl and flash of colour but nobody ever mentioned her friend and slowly Alice began to believe she’d imagined him. Through all of her loneliness, Alice was most content escaping to her secret space, a small concrete yard enclosed by huge ivy covered walls. In the corner where the broken flags hadn’t been replaced was a small patch of dirt. This was Alice’s garden. She nurtured the straggly weeds that struggled to survive in the shade of the giant wall. Each visit she carried small cups of water down the three flights of stairs, careful to not spill a drop of the precious water. Occasionally she’d plant seeds but nothing really grew. It was here Alice would sit and dream about what lay beyond the wall, a princess’ castle, a fairy village or an enchanted forest. The characters of her musings became her friends. One gloriously sunny day, Alice, cups in hand, wandered down to wild flower garden. She bent to water her flowers and stopped in dismay. The delicate pink and white weeds had withered and curled in the hot sun, their leaves lying brown and crisp on the dry earth. Alice kicked at the dust in frustration. She knew it was futile but it felt good to take out her anger on the useless soil that had failed her flowers. Feeling the tension leave her body she gave one last kick. As the dust rose up around her something glinted from the soil. 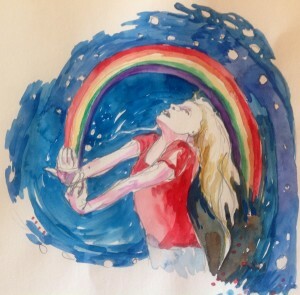 Alice poked it with her toe and a rainbow of light sparkled in the grey. Kneeling down her eager fingers dug the rest of it out and wiped it clean on the bottom of her T-shirt. She ran her fingers down the smooth crystal of a broken prism. Delighted she turned her treasure round and round in the sunlight marvelling at the dancing beams darting round the drab yard and transforming the grey into a rainbow of light. As she spun and twirled something inside her stirred, that familiar tingle when she tried to remember her lost friend surfaced and warmness spread from her heart right to the fingertips clutching the prism. Alice soon stopped wondering what the strange feeling was and lost herself in the magical moment. Soon though it was time to go back, she hung the prism from a woody ivy branch so it could spread its magic over her dead garden. If she couldn’t have flowers, she would at least have a rainbow garden. As Alice slept that night something was awakening within her, that drowsy slow awakening where it really didn’t remember going to sleep or even how long it had been asleep. Three floors below in the little yard the prism, gently swinging in the breeze was soaking up the silver moonlight. Shimmers of rainbow moonbeams reached up to Alice’s bare window and caressed her sleeping form. Her gently rising chest warmed and tingled rejuvenating the sleepy elf inside. Ever so slowly the realisation of his self and his purpose came back to Tiptoes. He was here for Alice, to be her friend and guardian and maybe add in a little mischief when things were getting boring. Tiptoes listened in on Alice’s dreams saddened by her longing to find a friend and recognising that incomplete feeling lodged deep in her young soul. 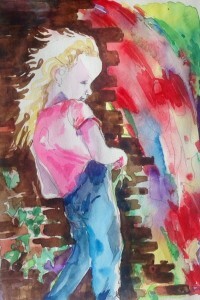 Tiptoes vowed to find a way to help her though he wasn’t sure how; after all, what could he do other than cast rainbows? The next day Alice rose feeling amazing. Something had changed within her and she no longer felt quite so melancholy or alone. She peeped out of the window and stared in amazement at the flash of colour in the corner of the little yard below. Eager to get down there she grabbed the nearest clothes and ran down the three flights of stairs. Her eyes had not deceived her. The brown, curled weeds of yesterday stood proud, fresh green leaves weighed down with dewdrops and beautiful dainty flowers adorned every stem. The prism’s rainbow rays kissed the delicate petals of each one till they glowed with iridescent light. 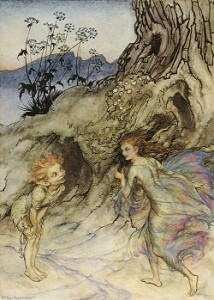 Tiptoes smiled as he felt the spirits of the lonely little girl soar. 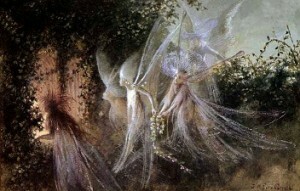 Kneeling in the new rich soil, Alice stroked each flower in her amazing magical garden revelling in their beauty. But after a while she leaned back against the wall and closed her eyes, her shoulders dropped and a single tear made its way down her cheek. What good was it to have a beautiful garden if you have nobody to share it with? That single sad thought encompassed her and her little body shook with silent sobs. Tiptoes called out to her to reassure her she was not alone any longer but her grief had closed off her mind to the little voice she held so dear just a few years previously. Alice made her way back to the flat, tired and dejected she crawled back into bed and pulled the covers over her head. The next day she was awakened by something, but what? 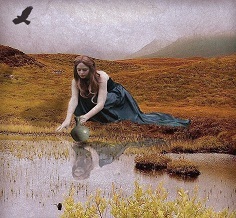 She knew she should remember what it was but it was like trying to find a shiny coin at the bottom of a cloudy pond. She did know, or rather felt, that the familiar tingle in her chest was getting more insistent. Swinging her legs out of bed she felt drawn once again to the window. Her flowers were still there but that didn’t seem to be what the tingle was trying to show her. Alice pulled on her T-shirt and shorts and skipped down the stairs to the yard. Inside of Alice, Tiptoes was also building with excitement like he was about to be given the most special gift. He had no idea why he was feeling this but the same pull that was drawing Alice had its grip on him too. Once outside Alice breathed in the cool morning air; the sun was just lazily spreading its rays and the prism sent them darting around the small space. 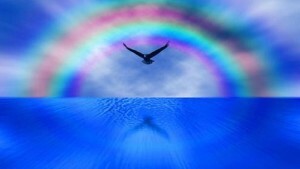 Tiptoes reached out to the rainbow sparkles sending his own rainbow out to join with them. The air around became charged, Alice shivered and goose bumps rose on her arms. Something was about to happen. Something magical. To her amazement the tiny coloured rays rolled out a path in front of her, beckoning her to follow. Alice took a few tentative steps, Tiptoes willing her on, the strange tingle became an urgent buzz like a whole bag of popping candy exploding in her tummy, forcing Alice forward to the ivy covered wall. 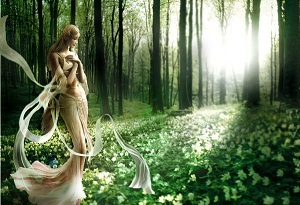 Not knowing why she was doing it she put out her hands and entwined her fingers in the ivy stems. First gently separating them then prising them roughly apart as she realised with glee there was a hole hidden behind the thick bushy vines. At last she would see what was on the other side of the wall. Would it be a castle, a forest, a cave full of sleeping dragons? The draw in Tiptoes was also escalating, he could feel her elation and understand her joy at having the mystery of the giant wall almost in her grasp but he felt he had a different purpose here. Soon the hole was big enough to stick her head through. Alice took a deep breath and savoured the moment of excitement. She was just about to kneel down and peep through when a noise on the other side startled her. Alice jumped back tumbling over. As she lay on the ground the rustling noise started again. ‘M m me,’ stuttered Alice to the invisible owner of the voice. ‘We just moved in next door. Do you want to be our friend?’ said the voice. Alice rolled forward onto her knees and slowly crawled to the hole. She’d dreamed of many things on the other side of the wall but other children? She took another deep breath, poked her head through the hole and wriggled her shoulders through the twiggy hole. 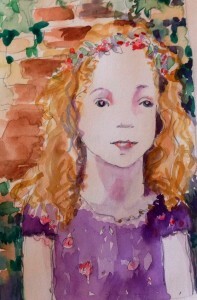 The ivy bows gave and Alice tumbled at the feet of a rather grubby little boy with the widest grin. Behind him a little girl shyly held out a paper bag of sweets. Alice stood up and beamed at her new friends. You can read more about Sylva Fae, and follow her on Facebook at www.facebook.com/SylvaFae where she will be shortly announcing the inauguration of her blog. You can also follow her at @SylvaFae on twitter. This is a writer I will be following with great interest. Her mother, the accomplished artist Christine Southworth created the beautiful water colour pictures for the story. Not since reading C.S. Lewis’s Narnia books have I so much enjoyed a novel written for children of all ages, especially those who have managed to preserve the infinitely curious magical child in their heart. 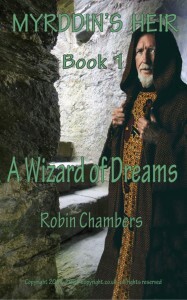 In his ‘Myrddin’s Heir’ series Robin Chambers masterfully brings magic right up to date, while exciting the imagination about its long reach of influence in the past. So far I have only read the first book, ‘A Wizard of Dreams,’ but am eagerly anticipating continuing the adventure throughout the rest. He prefaces the novel with this sound advice: ‘Love Learning; Respect Difference; Protect Your Planet.’ These tenets are firmly yet tenderly embedded in the heart of the book, the message always soundly delivered with the lightest touch. We join Gordon at the beginning of his life, and know from the first enticing paragraph that this is an extraordinary boy. At the same time we are introduced to the mysterious Zack. Is he imaginary friend, alter ego, guardian angel, spirit guide? You will keep wondering and guessing. Zack is as integral to the plot as Gordon himself, and equally real. We come to love them both. They – and all the characters in the book – are so skilfully drawn that they take on a life of their own. We follow Gordon and Zack through his time in nursery and primary school right up to the day when he starts secondary school, just after his momentous 11th birthday when he discovers in an incredible encounter with the legendary past the extraordinary destiny lined up for a boy blessed with his extraordinary powers. Prior to this, as we join Gordon on his everyday adventures through a boy’s young life as well as his more mystical journeying, we learn on the hoof a vast wealth of information about dinosaurs, the planet, language, literature, and magic. Robin Chambers writes in a way that inspires a delight in learning and whets the curiosity, with a trail of reminders after each chapter, which lead to extensive notes at the end of the book offering elucidation for those who want to learn more. I quickly grew fond of Gordon, and some of the descriptions of his experiences brought tears to my eyes. For me, one of the essential marks of a good writer is that they arouse empathy for their characters. Why else would I go on reading unless I cared what happened to them, and were in some way touched by them? The issue of bullying was particularly poignant in the way that it was handled by the author. We are shown the reasons behind it as well as Gordon’s response to it, and towards the end of the book there is a resolution for the bully himself that again moved me to tears. Yet there is nothing mushy or sentimental about the story. It’s an adventure that spans space, time and other dimensions, which for a whole generation of children (including me – old enough to be Gordon’s grandmother!) is what we have come to expect. Brought up on Dr Who, Star Wars and Harry Potter, we are hungry for more magic and are ready to soar with Gordon to wherever the flights of the author’s imagination dares to take us. I have been careful here to give nothing of the actual story away, because I want you to have the wonderful experience of reading it, to follow the sparkling threads of narrative along the magical paths that lead to the brilliantly inspiring and suspenseful conclusion… Except, it isn’t the conclusion, and as the final chapter ends we are left breathless on the brink of Gordon’s next adventure – nothing for it but to do as I did and immediately download the second book! I know already I will be entranced by the beautifully composed language as well as the twists and turns of narrative created by this most accomplished author. A long time ago in earthly years, but the merest distance of a dream away as far as the Fairy world is concerned, there lived an elf child called Tiptoes, who was the beloved of his many brothers and sisters, and of the Elf Queen and King who ruled over Elfdom with wisdom and love. Tiptoes had a special gift, as all elf children do, and since there are so many magical gifts to go round it isn’t difficult for each to be unique. Tiptoes had the gift of weaving rainbows, one which made him especially popular – because everyone is touched by rainbow magic, whether they see it in the eye of a crystal or peeping behind a rain cloud or shimmering in a summer waterfall. And Tiptoes could weave the kind of rainbow that would circle your heart like the softest of gossamer, bright and beautiful and sprinkled with hope. 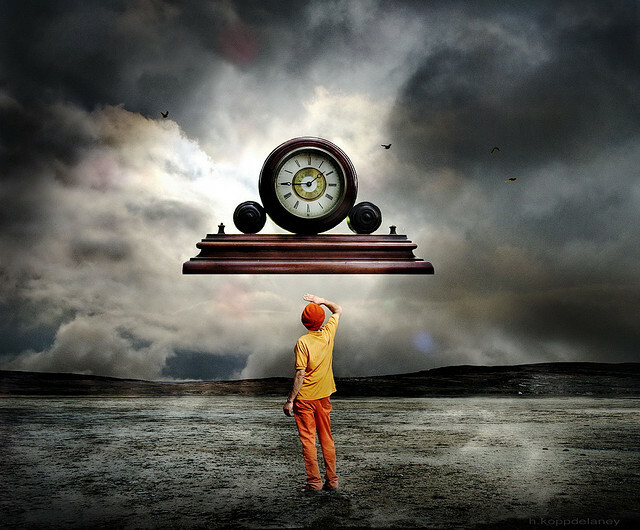 “Time?” answered Tiptoes, curious because until now time had not been of particular significance. Days began when light filtered through the green canopy of his tree nest, and ended when his eyes grew heavy with the dusk. Time trickled like the bubbling stream on the forest floor: it flowed and flowed, and would always flow. There was always time: time enough, time to spare, plenty of time. And now the Queen was telling him it was nearly time. For some odd inexplicable reason that phrase filled Tiptoes with a feeling he had never felt before: he had no words to describe it to himself, but it crept with cold and left him suddenly with a vision of himself as separate. A word formed in his mind, as if he had always known it somewhere, but just forgotten: alone. Somehow he understood that what it was nearly time for would cause him to be alone. “For ever?” said Tiptoes, this new idea of what always might contain settling in him like the coldest of winter water, numbing his heart. “No, not for ever,” reassured the Queen, touching him lightly with the tip of her nearest wing, so that Tiptoes felt the tingling warmth ripple through him and free his heart again. “Then how long?” he asked quaveringly. “And why?” To a little elf, happily engaged in play and merriment, this exile made no sense. “Humankind…” Tiptoes repeated in an awed whisper. He had heard myths about humans, but had never really believed they existed. “Reality?” said Tiptoes wonderingly. All these new words, bringing strange feelings along on their tails, like kites fluttering in the wind… This felt like a very heavy word. Tiptoes snuggled up to her as her silvery voice explained to him what until now had been a secret mystery, far beyond the imaginings of himself and all his playmates. “…You join your human right at the start of their life in Reality,” said the Queen. “They can see you then, because they’re still a baby and they haven’t been taught the ways of the human world. But in a few years they learn not to believe in you any more, and…” Here the Queen sighed and curled the edges of her wings around to make a warm shawl for little Tiptoes. “Forgetting?” echoed Tiptoes, once again with quizzical awe. “Will I be lonely?” asked Tiptoes, this new word coming to him with all the chill of that other word alone. He felt his tongue tingle with another new sensation: fear. “I’m afraid you may be, sometimes,” said the Queen sadly. “But in spite of your Forgetting, a part of you never forgets, and will always recognise another elf when you see it in a human. And they are truly magic moments, Tiptoes, when one awake elf meets another and they make contact through their human hearts. You’ll always know then, even if you Forget again, that you’ll never really be alone. And one day, of course, you’ll come back here, and be with your brothers and sisters again. “And will everything be the same then?” asked Tiptoes. The Queen shook her head slowly. “Ah, Tiptoes, nothing can ever be the same once you have dwelt inside a human. We change each other with our connection. You’ll be a grown up elf then, when you come back. A Wise Elf. You’ll have a different place in the Elfdom then. So far you’ve only seen the nursery, the forest garden. It’s a much bigger world than that. Tiptoes knew that what she was saying was the truth: already he felt different, just by knowing that his life would change. “How soon will it happen?” he asked. “Soon enough,” replied the Queen. She lifted him in her soft, gentle arms, kissed him tenderly, and put him back on the ground. He stood in front of her, scuffing his toes in the bracken, for the first time feeling an ache in his chest that he supposed was to do with the thought of missing her – another strange new concept. She smiled at him and Tiptoes felt the warmth of her smile surround him, like sunlight in the woodland clearing. 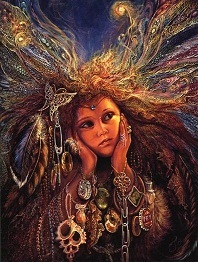 He looked up to bask in it as she spread her Elf Queen magnificence in all its full glory. Tiptoes wandered slowly back to the place he had known as home for as long as he could remember. It was odd to realise that there was a bigger world outside it, that beyond this forest there was a larger Elfdom, and somewhere beyond that, he supposed, the human world. And what other worlds might there be, that he had yet to learn of? His head felt full of new words, and all the peculiar feelings that came with them. As he walked, he absently wove a rainbow scarf that trailed behind him, winding about his shoulders as if to protect him from the breeze. As he noticed this, he became aware of a Stranger Elf, who had approached through the trees and was walking alongside him. There was something in his bearing that made Tiptoes realise this was one of the Wise Elves of whom the Queen had spoken. This elf was clad in green, like Tiptoes, but was taller, older, with a kindly smile and a mischievous gleam in his golden eyes. “Protect me from what?” asked Tiptoes, searching in the golden eyes of his companion for some clue. Tiptoes gulped. “Other kind?” he said. As suddenly as he had arrived, the Wise Elf left, and Tiptoes found he had reached the place under the Biggest Oak where the Elf Queen had first come to him that day. There were his brothers and sisters, still playing in the sunlight, laughing and calling to one another, jumping up to catch the breeze on their gossamer wings, letting themselves drift with the warm air currents to the lowest branches, rolling over and over as they went, chasing the butterflies. Innocence – the word came to Tiptoes from somewhere deep inside him. Had there been another Forgetting, at some other time, from which he was remembering these strange words now? Tiptoes was thoughtful as he went to join the others, no longer feeling able to join in their games in his old, careless way. He was aware now of a different way of seeing them, of seeing himself in relation to them, and of another new concept: Last Time. He felt an odd ache inside him. 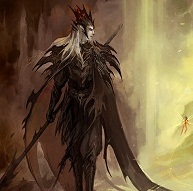 He stood on the edge of the group, watching them, wondering when his next summons from the Elf Queen would come. He knew what it would mean. Or would it, he wondered, be the Elf King who gave the final call? But he was not an elf for brooding over-long, and soon he was joyfully up to his usual tricks, living as always in the perfect golden moment. Sitting by the stream next morning, dangling his toes in the gurgling water and teasing the darting multicoloured fish, he caught glimpses of his reflection in the broken surface. Suddenly, he saw another reflection dancing beside his own, and turned to see a beautiful elf wearing a shimmering gown of luminous rainbows. Just looking at her made him want to weave yet more colours to adorn her. He could tell at once that she was another of the Wise Ones, sent to instruct him, and immediately a thousand questions formed themselves inside his mind. She laughed at his eagerness. “Oh, little one, you must be patient!” she said. “Some questions only you can answer for yourself. You’ll see… In the meanwhile, let me show you something of what is ahead of you…” And she bent forward and dabbled her fingers in the stream until there were no more fragments of images, only the pattern her fingers made. And there, in the water, a picture formed, as clear and still as if it stood beside them on the bank. 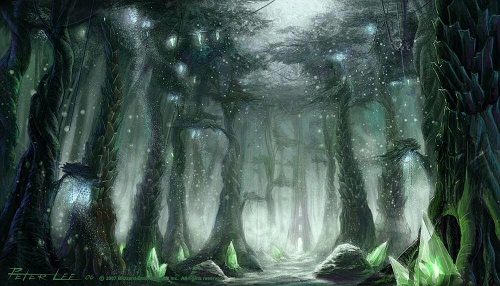 It was the figure of a young woman, barely more than a girl, who smiled a secret smile to herself and seemed to stare out at them as if she could see them, although Tiptoes knew that she was very far away from this elfin grove. Although he had never seen one before, he could tell at once that she was a human. His heart seemed to skip a beat, and he gasped, breathless with the strangest new feeling of all. “Oh, she’s beautiful!” he said. “Oh,” said Tiptoes. “Mother.” Another new word, and one which belonged to that strange, full feeling in his heart. A wonderful word. He spun round in the air with delight. “Oh! Oh! Oh!” he cried, brimming with joy at the splendid adventure ahead. How had he lived only for play, without knowing the glorious passion of having a mission? “Her?” repeated Tiptoes. “A girl!” Somehow it had never occurred to him that he would have to spend most of what amounted to a human life inside a girl. He wondered how it would feel, and whether his mother would spot him there. And then, just for a second, the enormity of his task seemed to crush his vibrant energy. The Wise One understood. “Sunram and Moonfish?” asked Tiptoes, hardly daring to believe this might be true. For these were his favourite brother and sister, and already they had shared so many adventures and games in their forest home. “And they are both champion rainbow weavers, too!” cried Tiptoes excitedly, thinking of all the fun they’d had together, inventing new colours and spinning them into the world. “Goodbye…” said Tiptoes wonderingly, tasting the feel of it. It was a word none of them had needed until now. When they met beside the Biggest Oak the three elf friends hugged one another, and chattered about the times they would have in the human world, and the even better times when they were back together in this magical place they knew and loved. “Oh, I feel such a pain in my heart!” cried Moonfish, a silvery tear falling down her cheek. She touched it, then lifted the wetness to examine it with awe. There had never been a cause for tears before. “That’s missing me,” said Tiptoes, who had always been the one to invent and explain words. “It’ll be excellent fun – what a laugh!” said Sunram. He was the boldest of the three. But even he looked uncertain at the prospect of the Great Unknown. “You will make sure of waking me, won’t you, if I’ve fallen asleep by the time you come?” said Tiptoes, suddenly anxious. “You’ll always know us by our rainbows,” said Moonfish. “It will be all right, won’t it?” said Tiptoes. He knew it was almost time, he could feel the future coming through the forest to meet him. And then he remembered mother and the beautiful achy feeling he had experienced, just looking at her. He knew he would be transformed by his time with the humans – a word the Elf Queen hadn’t used, but the only one that would do. 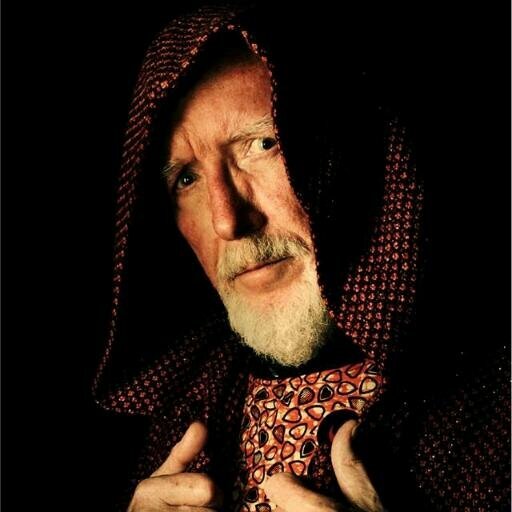 He also knew that it was the way of things, the ancient way, the way that as a young elf he couldn’t expect to understand, but that already he accepted. An elf had to do what an elf had to do. And there would be rainbows. She was right. I had never been exactly innovative on the sandwich front. Truth has been a pervasive theme throughout my life. When I was a child lying was synonymous with betrayal of a mysterious code laid down in a history that preceded mine. There were an awful lot of rules that simply had to be obeyed, and questioning them wasn’t really much of an option. My mother convinced me that she could read my mind and knew my every wrongful intention, and it took some years before I realised that was about as factual as the tooth fairy. As a ploy for keeping me in line it worked pretty well, however, although I wouldn’t recommend it as a skilful parenting strategy. As a result of this, perhaps, (or maybe just another part of the inescapable genetic blueprint) I reached adulthood with a passion for truth-telling and truth-seeking. I also, somewhat naively, assumed that everyone else shared it. It took even more years before I realised that the rest of the world hadn’t been trained according to the often baffling family code that had been my birthright. Truth and trust are so bound up for me that I struggle to regain trust in someone if they lie to me. Respect and trust are so bound up for me that if I can’t trust someone then I lose respect for them. Sorry, but that’s just how it is. On the other hand, much like my daughter, I am infinitely forgiving, so if I’ve lost respect and trust for someone then I work very hard within myself to rebuild it. Loss of respect is one of the near enemies of love, and I feel deeply uncomfortable keeping anyone out of my heart. 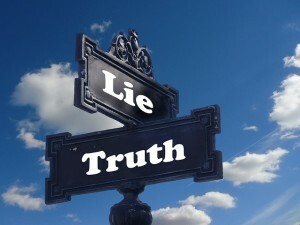 After all, judgement kicks aside compassion, and one small lie is so often not so much a moral lapse as a face saver or an attempt to sugar an unpalatable pill of truth. And even big lies may carry with them a whole dossier of justifications. We can be just as evasive with ourselves as with other people. I know this because I have been guilty of telling lies myself. Sometimes tiny social ones to avoid hurting someone’s feelings or to sidestep a clash of opinions that can only lead to unnecessary drama (see what I mean about justifications? We’re really good at them.) But at certain times, throughout my life, I have told whopping great lies, slippery lies of omission, left hand not admitting to right hand what it’s doing kind of lies. Not often, and never without the agony of lingering guilt, but nevertheless, since I’m being honest now… might as well fess up. So at those times, the whole loss of trust and respect thing has turned me against me. It’s an interesting process, rebuilding bridges between parts of your ambivalent self. Truth, as I’ve observed over and again, is something of a shape-shifter. My truth is not necessarily your truth. There are times when this can become an issue, times when it’s better to let it go. If I allow your truth to take precedence over my truth, and in doing so compromise my integrity, then I am betraying my true self. If your version of events and mine don’t tally simply because we were standing at different places and saw different things, then I can go along with that. But if you tell me that what I saw was not what I saw, and insist that the only correct perspective is yours, then my self-belief is swallowed by the black hole of your certainty, and I am lost. This is one of the fundamental elements that constitute abuse, when your lie causes me to doubt the reality of my own experience. Those are the worst lies, in my book – the ones that mess with someone else’s head in the service of another person dodging the consequences of their actions. We are strange creatures, us human beings – supposedly the top of the tree of evolution, but I definitely doubt it. We have way to go yet for our spirituality to catch up with the complex depravities of our self-interested nature. We lie to ourselves and each other about our motives and values and collude with the vast industry of untruth that is advertising, because our ego says more and better even though our heart may be sickened and our soul has curled up in despair. We know how to lie, and so we do. We begin as early as the moment that we recognise that your brain and my brain are capable of holding differing realities. We love trickery, and we like being fooled – as long as it’s all a game and everyone agrees the rules. When the stage magician saws the lady in half we squeal with horror, because we know it’s an illusion and we’re buying into it. It’s one of those circumstances where we love having the wool pulled over our eyes. But when you say you love me and you mean “for now” and I believe “forever” is that a lie you’re telling me, or one I’m telling myself? If we agree to believe a lie one of us is telling is that sometimes a necessary collusion? We see the flaws in one another and blink to make them disappear, hoping it works both ways. If we promise one thing and deliver another, does that constitute a lie, or is it simply our innate capacity for raising expectations we can’t fulfil? I am wary of anyone who says they are 100% reliable, or 100% anything. And don’t get me started on that 110% thing. That’s worthy of a whole blog post to itself. So when it comes to The Truth I tend to be cautious. That sounds like a dead end to me, or something that’s been neatly fitted into a conveniently portable box. I have always been curious. You show me a box and I’ll want to take the lid off to discover what’s inside. Like Alice in Wonderland, sometimes I believe in as many as six impossible things before breakfast. Especially now I have facebook and twitter to keep me abreast of the news. What I have found is that although certain things feel true, I can only with any real certainty say that they are true for me. That love is the glue that holds the universe together feels like truth, but maybe it’s only the glue that holds me together. Once the world was definitely flat, now it’s definitely roundish – who knows whether any of this is real anyway? Black holes and Multiverse theory and quantum physics have inspired, confused and awed me. We live in exciting times. Mysteries abound. Not least, for me, is how does any of this amazing technology work? I don’t even know how my body works. And my brain, or anyone’s brain… do scientists actually understand much of what’s going on there yet? So I remain appropriately humble on the subject of Truth. I respect yours, and will always be fascinated by how you arrived at the beliefs you’ve come to espouse. Did you unpick the truths you were offered on a plate as a child? Did you examine them and re-examine them and only accept them when you found evidence to back them up? Did you commit to the truths embedded in one particular political party or religion because it made sense with your head or resonated with the feeling in your heart or your gut? Do you stand by the truth you believe in to the extent that you refuse to acknowledge any additional data that might cause you to question it? Are you grounded enough in what you think to be true that you can say with confidence: “I know” rather than “I believe”? I know that I am here in this moment, and that you – whoever you are – are there in your own private bubble of selfness. This much is true. As far as I can tell. But the ultimate truth of who ‘I’ am, and ‘you’ are is open to conjecture. One of the books that affected me deeply many years ago was ‘A year to live’. In it Stephen Levine poses the question: “If you only had a year to live, what would you do differently?” On his deathbed, Socrates said that dying was the highest form of wisdom, and Levine decided to experiment with living for a year in that state of immediacy, consciously living each day as if it were his last, to see how it changed his perspective. The book is about what he learned from that, and from his interviews with the terminally ill. It might sound like a sombre read, but for me it was powerfully affecting, inspiring, and heartening, and I’ve shared the ideas in it with many people. It always is unexpected. It’s the paradox with which we sit uneasily throughout our lifetime. We know death happens – but it isn’t quite real. We fictionalise it, we dramatise it, we sensationalise it, we scare ourselves and each other with stories about it, we even joke about it – secure in the knowledge that it doesn’t apply to us, or anyone we love or know… not yet. Until one day it does. None of us is going to get out of this alive. Am I a little bit crazy to find that a comforting thought? When I was a child I became terrified at the notion of non-being, round about the age my ego starting noticing that I was separate in my beingness. Now, so many years later, I have exchanged that concept of a cold, empty, vast eternity of loneliness which haunted me at the age of 4 for one of ultimate connectedness. As I said, none of us is going to get out of this alive, and we are all in this together. If so many people that dropped out of this level of consciousness before me managed to do it, then it must be as relatively simple as the transition from womb to birth. I have never been able to achieve the high degree of focused awareness that Stephen Levine describes in his book. I am restless when it comes to sitting meditation – which is why I advocate mindfulness in daily life: in speech, thought, actions and interactions. I don’t always remember that today may be the last day of my life, as well as the beginning of the rest of my life. Sometimes I get caught up in the detail and forget to pay attention to the bigger picture. Sometimes I am so busy thinking about me that I forget to feel how connected I am to everything that is not me. Sometimes pain, or fear, or any of the old familiar ego states, shrinks the universe into this miniscule world within the world that is me. I am always happiest when I do remember, when I let go of me and find everything beyond that in all its immense beauty. I remembered Stephen Levine’s book when I was having tea the other day with an old friend, an artist with a shining soul and a sharp insightful mind. Our conversations have always soared headily when we talk about psychology, metaphysics and different levels of reality. He was describing his ongoing worsening anxiety. He’s been depressed and anxious for most of the 30 years I’ve known him, which fills me with such deep compassion. I love him like a brother, and if I could lift the burden from him I would. We were discussing getting older, and all the challenges that brings – no longer having the confident belief that comes so naturally in youth that ailments are transient rather than likely to be incremental. For the person already proficient in anxiety the later years are a minefield of easily triggered concerns about health and survival that can verge on the obsessive. There’s so much that’s bound to go wrong with the body. We’re genetically coded to disintegrate. Like an old car that has managed numerous times to just about pass its MOT we are now at the age where the mechanic looks us over and shakes his head ruefully. I’ve never minded about getting older. Perhaps it will suddenly hit me at some point, but since I only feel about 35 in my head (an optimum age in my opinion) and rarely look in the mirror, I can dwell safely in the knowledge that I’m only as old as I feel. This works just fine, except on those days when my body feels a lot older and complains about its various malfunctions. Sometimes this is a state to be pushed through, and sometimes there’s a case for just listening to the inner moaning and love bombing it with gentleness and compassion. There are times we need just to stay where we are and get to know and understand and accept the place. The one sure thing is that everything changes, and nothing lasts. Listening to my friend, I remembered all those times I’d needed to listen to myself and just be kind about my own suffering. But I also wanted to offer him some simple recipe that might enable him to move beyond his endemic death anxiety. So I started telling him about Stephen Levine’s book, and what I’d learned from it. He was very receptive to the concepts of mindfulness I described, although he pointed out that since his every moment was filled with anxiety, this was probably not going to work for him. Doggedly, I persisted, hoping he might have one of those magical experiences where our perspective shifts from foreground to background, like those weird optical illusions that you don’t get until suddenly you do. “But wouldn’t every minute you had left be really precious, and not worth wasting on anything except being here?” I could feel my eyes glowing the way they tend to do when I get all passionate and excited about something. Having had times when I’ve been where he was that day, I was also aware that a person with glowing eyes speaking fervently about being positive when you feel down can be a real pain. “So maybe it would work if you reduced it to six months?” I said. “We’re talking about an experiment, after all – living ‘as if’.” Although what was I thinking, really? Who was I so confidently to advocate feeling the fear and facing it anyway? It wasn’t my fear, but my friend’s. Stephen Levine might have managed to sustain a year’s worth of daily minute-by-minute practice, but however much I agreed with his ideas, I struggled to be that present to life all the time. My urge towards evangelism suddenly skittered to a halt. It was my perspective that changed, not his. Here we were, in our blessed bubble of deep affection, knowing one another so tenderly in our hearts, rapt in each other’s presence – he in his part of the dance, me in mine. Did we really need to be any more in the moment than this? Years ago, when my children were small, I used to enjoy cooking for them. Tales are now told of the unremitting packed lunch treats of homemade flapjack that would be surreptitiously exchanged at break-time for KitKats and crisps. Innocently unaware of this quietly rebellious subterfuge, I continued to provide a daily smorgasbord of healthy snacks, and not entirely because of the maternal instinct to nurture. I just loved cooking. Cooking and writing were my two favourite ways of spending a day. My house was dusty, but I hardly noticed that, poring over recipes in my tiny kitchen, creating delicious cakes that always rose and painstakingly concocted curries, lasagnes and pies. I loved the way the house smelled when things were cooking. I would then set the oven timer and retreat to my dusky pink writing lair – a friend recently reminded me that I used to call it my writing womb – and sink with deep satisfaction into whatever my latest writing project happened to be. One of my daughter’s memories of that time is of playing at the end of the garden and looking up to see me sitting at my desk in front of the window, typing away, quite oblivious of her waving at me. One of my son’s is of hearing the sound of the typewriter – a constant reassuring backdrop indicating that I was there, while also not there, engrossed in the alternative world I was creating on the page. It’s all so long ago now… the days of typewriters and their far from golden childhood. When my children grew older and we came to live in Oxford I lost much of the incentive to cook. They were off doing their own thing a lot of the time and I was busy remaking my life. Cooking became much more of a simple necessity rather than a creative pastime. For a while I did have the occasional lunch or dinner party, where the wine and conversation flowed with copious extravagance, but then life got much busier and I didn’t have time for all the preparation and the aftermath. It became easier to eat out and be spared the wreckage of the clearing up next day. Washing up while beleaguered by a hangover is at best a surreal experience, and at worst a severely depressing one. Like the days of my roseate writing womb, this period in my life is also a long time ago now. It was before I trained to be a psychotherapist and became a rather serious person. Just kidding. I don’t think I ever could be entirely that. Time went by, as by now you’ve probably gathered. Much water passed under the bridge – an appropriate metaphor for a life lived in such close proximity to the River Isis that flows so dark and deep beneath Oxford’s Magdalen Bridge. But this isn’t intended to be a memoir so I won’t go into details. 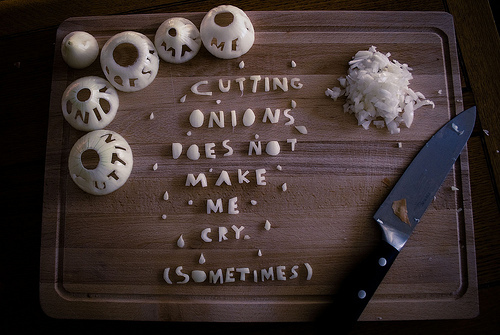 Instead I’ll return to the subject of cooking – my theme for today. When my joy in cooking resurrected in more recent years it came as something of a surprise to me. It started in a sneaky way, with a return to baking cakes. Once again, the house filled with the variously comforting odours of allspice, orange zest, lemons and ginger – and then eventually I rediscovered the art of making perfect chocolate brownies. In fact, it’s amazing how many variations on a theme there are when it comes to cakes involving chocolate. Well, anything involving chocolate, really. But again, I digress… I actually wanted to write about soup. One of the many things I learned during those formative years between the glory days of my hungover post-party renovations and now was the practice of mindfulness meditation. It came inevitably with the territory of psychotherapy. It began with sitting meditation, and then walking meditation (which had me collapsed in fits of giggles the first few times I attempted it, until I stopped thinking of the Ministry of Funny Walks and got the point.) And then, after a while of it, I realised that everything can be a meditation. Standing at a bus stop, eating an apple, drinking a cup of tea, filing your nails, washing up, cleaning the kitchen floor (when you share a house with a cat there’s an awful lot of that.) In fact, more or less everything you do can be done mindfully: paying attention to your breathing and to each small step of the process, being utterly present to the moment as it passes effortlessly into the next. But there are two such mindful meditations that for me are the happiest – one is gardening, and the other is making soup. I realised the first time it happened what an incredible blessing it was, this simple and yet somehow profoundly miraculous process of culinary creation. It begins with choosing the vegetables (ideally organic ones, at best from your own garden, but otherwise from the market.) The colours have to be right, to complement one another as they sit on your kitchen counter waiting for the knife. Don’t vegetables have the most amazing colours? I love the way the butternut squash and sweet potato glide softly through the orange spectrum to meet their match with the carrots. And the pale buttermilk cream of the parsnips offset by the cooler white and green of the leeks. And there, snugly nestling between them are the purple skinned red onions, glossy and bright, with sweet fire in their belly. No soup would be complete without them. As I peel and chop the vegetables, I enjoy the gentle rhythm of the knife against the board, observing the steady transformation from one state of vegetable being to another… the unclothed, diced vegetable has a quite different character from the jaunty one wearing its protective skin. My thoughts are all focused on this one operation, my breathing steady, my mind quiet. I and the vegetables are as one, although I am not the leeks and onions gently melting in the virgin olive oil, nor the colourful cascade of other vegetables that follow. Nevertheless we are engaged together in this business of making soup. As the heat rises through the stock and bubbles away, humming to itself a song that promises future nourishment, the wonderful smell of all these elements mingled together is like a heavenly choir of aroma. Or am I being fanciful? By now hunger is leaking round the edges of my mindfulness, but I can be mindfully hungry. Even that can be a meditation. Eventually, the concoction has simmered long enough to be ready for the next part. This requires a potato masher and a strong arm. No, I don’t use a blender – or a food processor. They would ruin the whole thing. This is an organic process, from start to finish. Me and the vegetables and my nascent appetite. We don’t want anything mechanical getting in the way of that. Finally, we are ready. The soup is done. I transfer just enough of it to my favourite bowl, the one just right for eating soup. I spread a slice of Irish soda bread with butter. I sit with my spoon ready, anticipating the first mouthful, marvelling as I always do that this is what food is all about – the wonder of turning simple ingredients into something that fills the belly with gratitude and love. So this is my soup meditation. Life is beautiful and all is well.